​CHICAGO (April 16, 2019) – In her Easter message, the Rev. 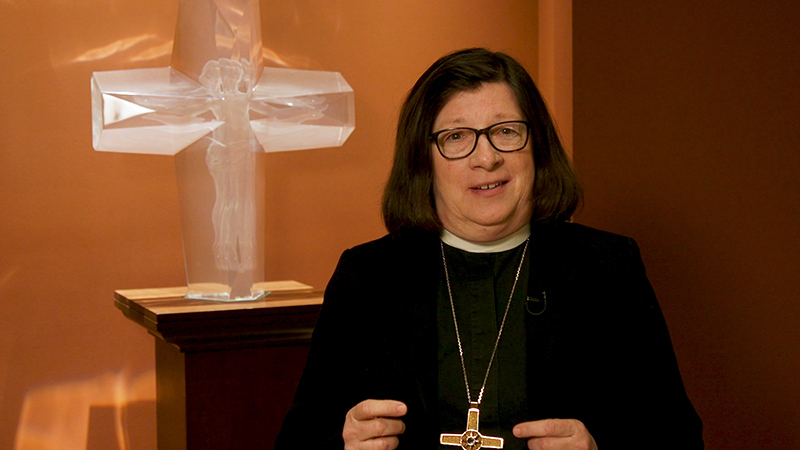 Elizabeth A. Eaton, presiding bishop of the Evangelical Lutheran Church in America (ELCA), reminds us that Easter makes it possible, even at the grave, to sing alleluia. View the message in English. View the message in Spanish. CHICAGO — Gathering under the theme "Be transformed by the renewing of your minds," the Conference of Bishops of the Evangelical Lutheran Church in America (ELCA) met here Feb. 28 – March 4. The conference is an advisory body of the ELCA that includes 65 synod bishops, the presiding bishop and the secretary. "Across differences, in the midst of significant challenges, our time together really was an experience of renewal and transformation in the power of the Spirit," said the Rev. William O. Gafkjen, bishop of the ELCA Indiana-Kentucky Synod and chair of the conference. For the first time, the bishops' meeting included a two-day retreat to discuss congregational vitality and topics related to leadership. "We spent time with each other exploring themes related to congregational vitality and the sorts of transformations required in our leadership and in the life of the church for us to embrace the renewal and new life the Holy Spirit offers," said Gafkjen. "We were reminded that, as we seek to cultivate and support vital congregations across the church, each synod is a laboratory of the Spirit." The bishops shared methods developed to support vital congregations in their respective synods. Examples include: offering group spiritual direction for rostered ministers; engaging congregations in intentional training, coaching and accompaniment in renewal and transformation over a multiyear commitment; and inviting pastors and deacons to join their synod bishop in a 48-hour prayer retreat. During the retreat, the bishops also reviewed "Trustworthy Servants of the People of God." This replacement document for "Vision and Expectations: Ordained Ministers in the ELCA" will be considered for adoption by the ELCA Church Council at its April 4-7 meeting. Read the draft document. Gafkjen said the retreat also provided "spiritual breathing room out of which arose, among other things, a pastoral message confessing and repenting of uneven and inequitable application of the document 'Vision and Expectations' and appropriate advice and counsel to the ELCA Church Council as they prepare to consider a revised replacement of that document at their meeting in April." During their meeting, the conference received an update report on synod diversity goals, a multicultural mission strategy to help assess each synod's progress toward increasing ethnic and racial diversity in its congregations. The conference spent time in conversation sharing ideas about tools to help report diversity goals. The strategy was developed in response to the resolution on racial justice adopted by the 2016 ELCA Churchwide Assembly. The conference also engaged in conversation with ELCA seminary presidents about dismantling racism in theological education and formation for ministry. A draft social statement on women and justice, titled "Faith, Sexism and Justice: A Lutheran Call to Action," was shared with the conference. The proposed social statement will be presented to the ELCA Church Council at its April meeting for consideration by the 2019 ELCA Churchwide Assembly in August. Addressing concerns about the situation in Venezuela, the conference issued a statement calling for "all parties to respect internationally recognized human rights," for "a halt to the deportation of Venezuelans currently in the U.S," and for "a new presidential election in Venezuela as soon as possible, one that will be administered by new electoral authorities, conducted under international supervision, and overseen by a neutral government." Read the statement in Spanish. The bishops also issued a letter to the bishops of the United Methodist Church, expressing "our abiding love and concern for The United Methodist Church and for you, its Council of Bishops." · An update on Always Being Made New: The Campaign for the ELCA. As of Jan. 31, the campaign has received $226 million for campaign priorities; $181 million in cash and commitments and $45 million in planned gifts. The campaign will close June 30, 2019. · A report from the director for Mission Support. Mission Support is the financial offering from congregations that is shared with synods and the churchwide organization. · Reports from the ELCA presiding bishop, vice president, treasurer and secretary, and updates from the Conference of Bishops' various committees. Approved by the ELCA Church Council in 1990, Vision and Expectations has, through several revisions, outlined this church's standards for its rostered ministers since that time. As a Conference of Bishops, we recognize and acknowledge that its application has been uneven and inequitable. We express our profound grief and deep regret for the times when Vision and Expectations has been misused to single out, marginalize, and block people seeking to be leaders in this church when their peers were not always held to the same vision and expectations. This has caused considerable pain that has disproportionately been borne by those who have been historically marginalized or excluded from leadership in the church because of their gender, sexuality, race, or status. We apologize to those whose treatment under this document has made them feel targeted and less than the beloved children of God that they are. The Conference of Bishops affirms the appropriateness of expectations and standards as means of protecting the people of God and providing accountability for the power that church leaders hold. Serving as a rostered minister in the ELCA is a privilege. Those aspiring to and serving in such a public office are expected to conform to the standards set by the church for such leaders. We aspire and pledge in the future to apply the church's standards for ministry with equity and compassion, to listen and take seriously the concerns of all our leaders—particularly those who historically have been marginalized—and to treat with dignity all those seeking to lead in our church. I I am dark, but lovely, O daughters of Jerusalem, Like the tents of Kedar, Like the curtains of Solomon.